I know that the Sifrei Emes (Tehillim, Mishlei, Iyov) use a different system of taamim. Why is this? All three books (Iyov Mishlei and Tehillim) are written in a complex poetic style. The separate trop represents the shift from prose to poetry and may have been sung in a more songful manner than the regular prose trop. A proof to this distinction lies in Iyov, whose first, second and final chapters are written in prose and have regular trop. 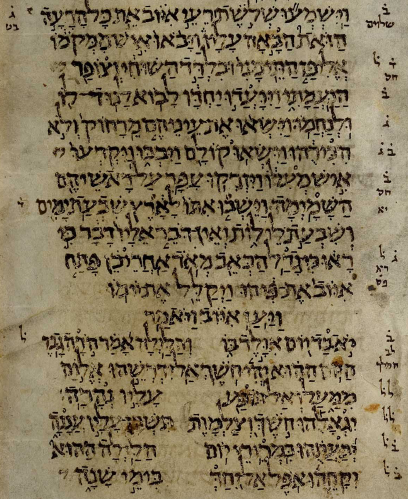 EDIT: The structural difference between the prose and poetry parts of Iyov can be seen in this clip from the Aleppo Codex (Keter Aram Tzova) showing Iyov 2:11 - 3:6. Notice how once it switches to poetry, the text is split into two columns reminicesnt of the way Ha'azinu is written in a Torah. This pattern extends through the poetic sections. Not the answer you're looking for? Browse other questions tagged tanach tehilim-psalms trop-cantillation mishlei job-iyov-book-of .